Kangaderoo Custom QR Code. : Electronic wallet, the QR Code, part IV. Quote from the movie Kill Bill: Vol. 2: "Daddy, I told Tommy that you were in Perth mining for silver.."
In my last post about crypto-currencies I mentioned mining. 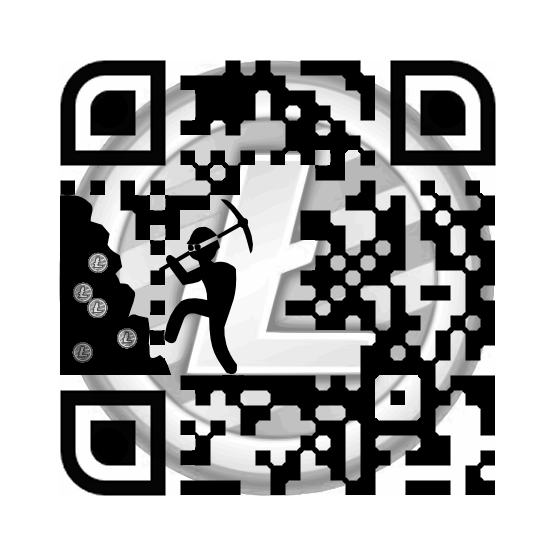 In order to experience the mining process I actually started mining for LiteCoin myself. Well not completely by myself, I joined a mining pool. Each transaction made with the digital money needs to be done with a money transfer order. A multiple of these money transfers are being calculated into a block. Mining is the calculation process to determine the validity of this calculation. Since multiple calculations can be valid, a procedure will select a new block based on a difficulty level. For a candidate block, also known as a share, the difficulty level needs to exceed the global set difficulty level of the currency. When the new block is accepted the finder of this block is rewarded with new coins. The global difficulty level is the controlling mechanism to prevent too many blocks to be generated. Most of the crypto-currencies have a predetermined and preferred update rate to control the amount of coins that are generated. The height of the rewarded number coins for the finder is also controlled, and will decrease to 0 in a fixed rate, making mining at the introduction of a new currency interesting, that is if this new currency will become an accepted currency in the future. When in the future new blocks are no longer reward with new coins, fee's on transactions will have to keep the currency alive. The reason I selected to work in a pool is a higher chance on being rewarded. Finding the share with a high enough difficulty level can more or less be compared with a lottery. The calculation speed of the currency itself is defined in GH/s. Where each Hash is the calculation that could be the new block. For LiteCoin (considered to be the number two to Bitcoin, and still mine-able by 'individuals') the global Hash-rate is about 42 GH/s. This total number 42 * 1000 * 1000 * 1000, can be considered the number of lottery tickets to win the reward of finding one block. In my trial, using CPU based mining, I got to about 10000 H/s. Giving me 10000 lottery tickets for this draw. The chance I have the 'winning ticket' is about 0.000023%. By joining a mining pool, in my case the LiteCoin pool of mining4all.eu, this way I increase my chances, but I have to share the winnings. A bigger pool size equals more calculating power, the higher the chance on finding a block.